Use our simple step-by-step guide to get an accurate, fast on-line quotation. Please note – for our 3 day service, we need your file by no later than 10.30am on the day of ordering. We know pretty much all of the gold lettering specifications for all UK Universities BUT we would like you to let us know your EXACT embossing requirements. • 1. You need to convert your file into PDF format. You can use free services from www.cutepdf.com or www.pdfonline.com. If you will be sending us more than one file, please clearly mark them, eg. pdf1, pdf2, pdf3 etc. • 2. After you have checked you files, attach them to an email and send to chesterbookbinders@hotmail.co.uk. Remember to include the following information in your covering email: the number of bindings, your chosen colour of bindings, your specific gold lettering requirements for the front cover and spine, whether you would like single or double sided printing, your full delivery postal address and your contact telephone number. Please also include any other information you may feel necessary, ie A3 pages, cd pockets etc. • 3. You will receive an email from us with a total cost and a full price breakdown. We will also provide details of how you can pay safely and securely. The total cost will include printing, binding and secure postage and packaging. • 4. When you have confirmed your payment to us (via email or telephone) we will commence with your work as instructed. • 5. We will receive an email with a package tracking number so that you can track your order. • 6. 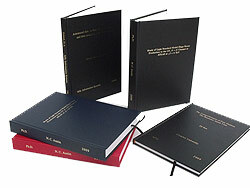 Your printed and bound thesis or dissertation will be delivered to your door three days later. Please note – all work must be with us by 10.30am for the 3 day service. Printed works will be delivered guaranteed by 1.00pm on the 3rd day. Want our binding only service? Please contact us for our binding only price list and details of postage.